The 40th anniversary of the historic one-hour satellite broadcast of Elvis Presley from the Honolulu International Center Arena in January 1973, viewed by over 1.5 billion people worldwide, is now commemorated with the release of ALOHA FROM HAWAII VIA SATELLITE: LEGACY EDITION. This deluxe double-CD package will be available everywhere March 19, 2013, through RCA/Legacy, a division of SONY MUSIC ENTERTAINMENT. 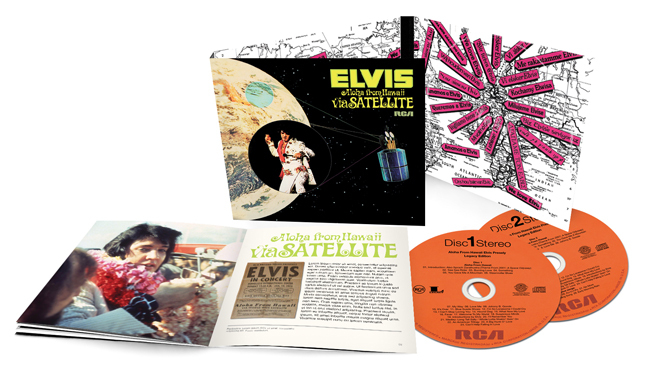 ALOHA FROM HAWAII VIA SATELLITE: LEGACY EDITION marks the first time that both shows performed by Elvis, as released separately in 1973 (the original double-LP Aloha From Hawaii via Satellite) and 1988 (the CD The Alternate Aloha), have been coupled together in one package. At the same time, the show that The Alternate Aloha was based on has been completely remixed from the original multi-track tapes. Accompanying the two-CD set will be a booklet with rare photos and a new liner notes essay written by BBC presenter, producer and musician Stuart Colman. This new Legacy Edition was produced by Rob Santos and Ernst Mikael Jørgensen, who along with Roger Semon, are the respected directors of RCA’s Elvis catalog for over two decades. “Aloha From Hawaii via Satellite” was the first time that a full-length concert was broadcast around the world and it was the most expensive up until then. Over 6,000 fans were in attendance for both shows at the H.I.C. (now known as the Blaisdell Arena). His love for Hawaii had first been demonstrated in March 1961, when he raised $62,000 with a concert at the Bloch Arena, toward the funding of the USS Arizona Memorial. The “Aloha From Hawaii via Satellite” show that was actually broadcast was a second show, that started at 12:30 a.m. in Hawaii on Sunday morning, January 14, 1973. Clearly at the top of his game, Elvis delivered a 24-song tour de force that pulled songs from every phase of his career. It was a painstaking process to develop material that did not duplicate very much of his Live At Madison Square Garden concerts of June 1972 (as heard on RCA/Legacy’s most recent Prince From Another Planet commemorative 2-CD+DVD package, released November 2012). Nor did Elvis want to duplicate very much of his then-current MGM theatrical release, Elvis On Tour, filmed in March-April 1972, the Golden Globe award-winning film which turned out to be the final motion picture of his lifetime. Following the 12:30 show, at about 3:00 a.m., the ensemble regrouped (without an audience) to record five additional songs exclusively for the U.S. broadcast, four of which originated on Elvis’ old Blue Hawaii movie soundtrack of 1961: “Blue Hawaii,” “Ku-U-I-Po,” “No More,” and “Hawaiian Wedding Song.” The fifth was Gordon Lightfoot’s “Early Morning Rain,” emblematic of the contemporary folk-rock singer-songwriter boom to which Elvis was surprisingly well attuned in the ’70s. “Aloha From Hawaii via Satellite” was broadcast to more than 40 nations, and broke viewing records in Japan, the Philippines, Korea, Hong Kong and Australia. Aloha From Hawaii via Satellite, the double-LP containing all 24 songs from the broadcast, was rush released to arrive in stores the first week of February, 1973. It debuted in the February 24th Billboard 200 albums chart, and sold a half-million units in its first four weeks. The single from the concert, Elvis’ version of James Taylor’s “Steamroller Blues,” debuted in April and reached the Top 20, selling in excess of 400,000 copies, #10 in Cashbox and #17 in Billboard. In the U.S., the broadcast was in fact postponed so as not to conflict with MGM’s Elvis On Tour. When “Aloha From Hawaii via Satellite” was finally aired in the U.S. on April 4th, the Nielsen ratings had the show in 33.8% of homes and reaching 51% of those watching television. The double-LP immediately vaulted up the charts, taking the #1 spot in Billboard’s May 5th issue, knocking Pink Floyd’s Dark Side of the Moon out of the top spot. It stayed on the chart for 52 weeks, and was certified 5-times platinum by the RIAA. The album was Elvis’ first #1 since the Roustabout movie soundtrack from January 1965. It was not generally known at the time that the Friday evening (January 12th) dress rehearsal had also been recorded, as a safety backup. Fifteen years later in June 1988 (more than a decade after Elvis’ death), the show was finally issued on CD as The Alternate Aloha.